Former heavyweight boxer-turned-actor Liam Neeson narrates “Manny,” a powerful, if superficial, documentary about legend-in-his-own-time Filipino boxer Manuel “Pacman” Pacquiao. Pacquiao is the only boxer in history to win championships across eight different weight classes. He’s a warrior-hero renowned in all of Boxing-dom, who’s also provided great hope and inspiration to his native land. His story follows the classic Hero’s Journey stages so precisely, we’ll line it all up, blow-by-blow, as they say in boxing. The hero is introduced, as he dwells in the ordinary world, in the village-compound of his upbringing: Born in 1978, Manny grew up during the bloody Philippines civil war, seeing dead bodies at age 5. Extreme poverty ruled; his family lived in a small nipa hut, roof and walls made of coconut leaves. No dad, no food. Mother woke the family at dawn to pray the rosary. Manny dropped out of school in 6th grade. At age 12, he was the man of the family. “The call” came in the form of moving in with his uncle, which also, in this case, encompasses “meeting the mentor.” Uncle trained him to box; Manny soon won a gold medal. Next comes “crossing the threshold,” where the hero leaves the ordinary world. To better help his family, Manny stowed away on a boat to Manila, starving, with no money—at age 13. One hundred million people now drop everything to watch him fight. Manny slept in the boxing ring of a gym; had to lie about his age to get his boxing license. At 98 pounds, he was 10 pounds under minimum weight. Even so, as a teenager, Manny KO’d all his much bigger opponents, and headed to America, seeking new possibilities. With Freddie Roach, the world’s best boxing coach in his corner, Manny takes down the world’s most-feared 122-pounder: South African super-bantamweight Lele Ledwaba. Roach rounds out Pacquiao’s skill set and hires a conditioning-coach who adds power, speed, and explosiveness to Manny’s arsenal. On top of the world now, Pacquiao could only fall. Like Pinocchio diminished his moral stature due to the temptation of the big city (symbolized by his growing donkey ears), so did Pacquiao start to gamble, drink, and cheat on his wife. Some of this phase is amusing: tiny but dangerous fighter singing romantic schmaltz, with relish, on talk shows. Like Dan Hill’s “I wanna hold you til I die…” Just no, Manny. And yet he’s having so much fun, you can’t help but enjoy him enjoying it. But one day the Divine speaks to Manny in a dream, asking, “Why have you left me?” Whereupon Manny drastically changes his life and ends his wicked ways. Also known as “bringing the gold back to the village compound,” Manny returns to the Philippines to become a politician. One hundred million people now drop everything to watch him fight. 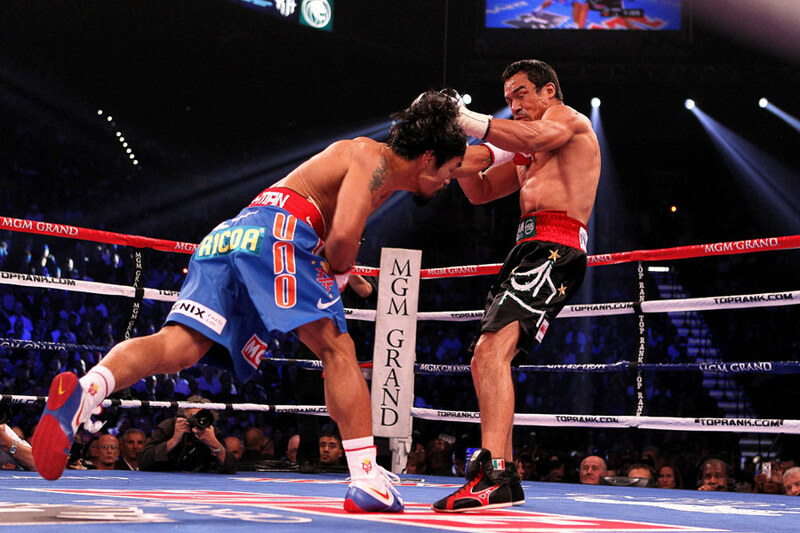 A must-see film for fight fans, “Manny” does, however, glide mostly on the surface of Pacquiao’s life. His work as a congressman and his public service are briefly shown by his sponsoring a new hospital. What resonates most, is how clear-eyed, sweet, stunningly naïve, and devoid of artifice Pacquiao seems in his interviews. His cockfighting operation is not mentioned. That he gambled is, but whether he gambled on the cockfighting is unclear. But one assumes Pacquiao may have emulated the great Roy Jones Jr. in watching cockfighting, which is understandable. Fighters fight. So do roosters, at the drop of a dime. Roy Jones studied fighting birds to sharpen his boxing technique. The filmmakers cruise past the legendary nastiness of the sport of boxing’s management. We all know by now the deceiving depths of Don King, but promoter Bob Arum is shown to subtly radiate the ruthless control that exploits Pacquiao. But the filmmakers aren’t out to reinvent the wheel, just pay homage to a shooting star. Manny’s life has it. Lesser talents’ lives do not have it. What resonates most, is how clear-eyed, sweet, stunningly naïve, and devoid of artifice Pacquiao seems in his interviews. He’s come full circle, back to the boy in the coconut-leaf nipa hut. Except now he has enough to eat. And so do his children. And his country and boxing fandom take sustenance in this knowledge.